Being thankful is the least of feelings kids are familiar with, especially in November when Christmas is around the corner and all they can think about is toys toys toys! Seriously though... Gratitude is hard to get out of 7-8 year-olds but once it is understood they become these little cute grateful machines ...and I love it! To start with, I ask the question: What are you thankful about?... you can see blank faces across the rug for a few seconds, suddenly you see a hand up and it's your brightest student raising his hand to say how thankful he is about this new video game he got last week. 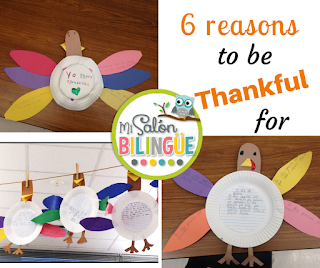 Then, after him, comes the rest of the class sharing how thankful they are about material stuff, but no one, ok maybe one, will share that he or she is thankful about his or her parents... That's it! So right after this discussion, I introduce my very, most favorite book in the world to talk about gratitude. The best thing about it is how simple it is for a mini lesson, of course, after this book rigor must follow, but for now, let's leave it as a great introduction to the theme. The book is called Gracias/Thanks by Pat Mora, I find it in my school library but if you don't have it my second choice is public libraries and the last is Amazon, you can probably find a used version. You can read it in english or spanish as well. In this book, the kid is thankful about many non-material things, some of them are silly daily happenings and will make your students laugh, for example, he is thankful for things every kid can relate to like splashing ocean waves or his Dad's chocolate syrup. You can read more about it and listen to Pat Mora's purpose to write this book [HERE]. In the link, there are some curriculum activities to do with this book as well. Now, if you ask the same question again about what they are thankful for, you may want to get some chart paper because this time you will find totally different answers! 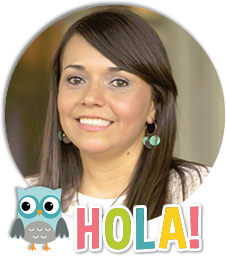 Scholars will be more aware about the daily things they get to enjoy other than their favorite toys. They will open up a little and will be creative and the discussion turns to be very interesting. Next, we move on to writing but we make it fun, so yes we do a craftivity. 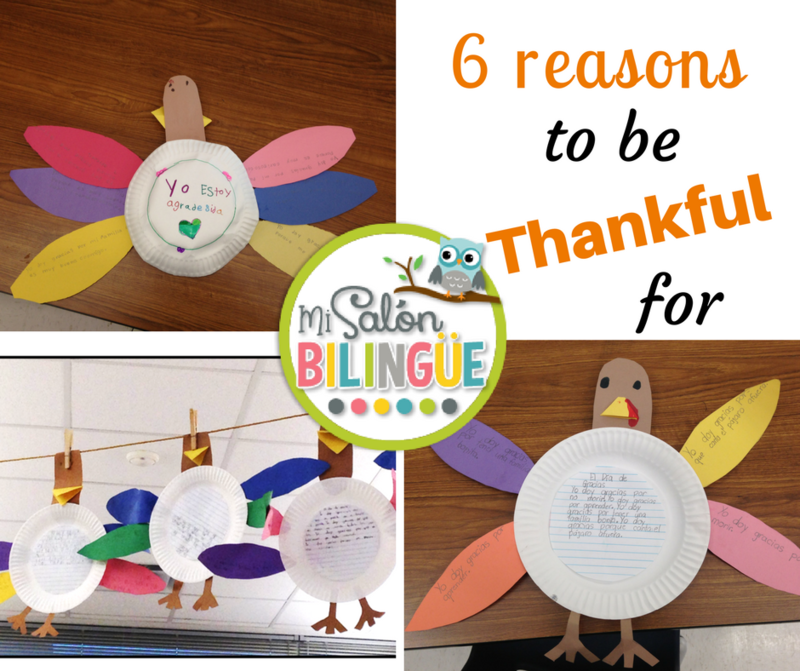 We do a paper-plate turkey with six construction paper feathers (or more upon request). Kids write one thing they are thankful about in each feather, well before the writing begins, you actually have the choice of letting them cut their own turkey parts or you could have everything precut for them, one will take them more time than the other so consider than when you are planning for this activity. I've done both and they probably enjoy it the same, it really just depends about how much time you've got. If you need templates for this activity get'em [HERE]. I use big and colorful feathers so that they can write full sentences. After they have brainstormed about their sentences, they assemble the turkey. Every Time I've done this activity, I model how to assemble the turkey first. The first step is to glue the feathers on the back of the paper plate like shown in the picture below. Then the peak and the head, last the legs. 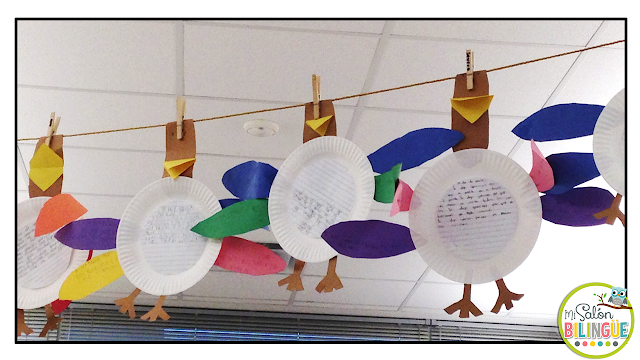 When the turkey is assembled, I like to ask my students to put their sentences together as a paragraph after a partner has helped editing and revising their writing. These are sentences from an english-speaking student.